Celtic knot wedding bands represent eternal love through their unending knot-work motifs. Gold Celtic wedding bands are available for both women and men in a vast assortment of widths and designs. Please note that any Celtic Knot Wedding Band pictured on this page in YELLOW gold is available as WHITE gold and vice versa. Any two-tone Celtic band is also available in the reverse combination. Please use the drop down to select your choice of gold color. 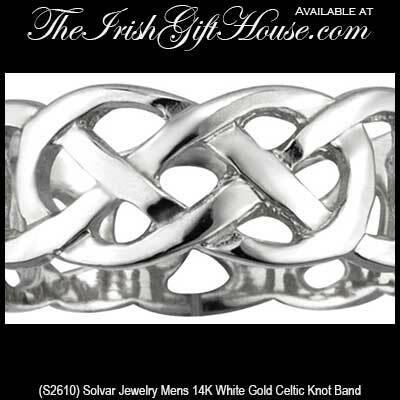 Solvar Irish Jewelry, Men's 14K White Gold, Celtic Knot Band.